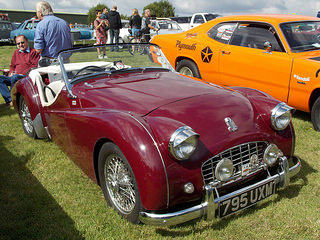 The Triumph TR3 sports car. In the mid 1950's, the sports car market in the UK was very active. 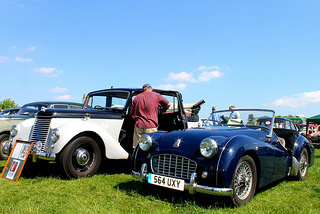 The main participants were Jaguar's XK120, MG's TC and TD, and Austin Healey's 100-4 and 100-6. 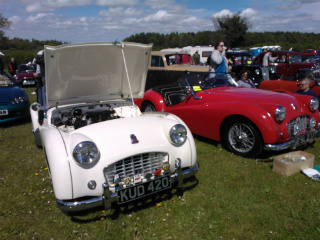 Into this mix was added the Triumph TR3. 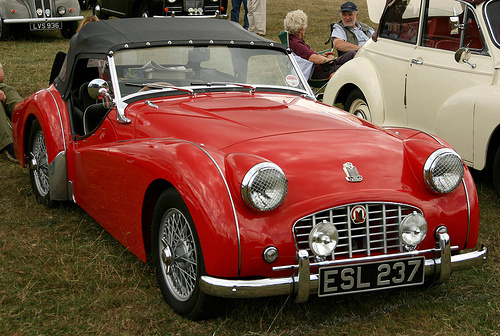 Between 1953 and 1955, it was the relaunch of the Triumph TR2, from its predecessor the TR1, that established the name of Triumph. 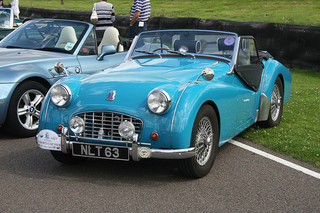 In fact, it was the upgraded version of the TR2 in 1955 that finally created the TR legend. In 1955, the Triumph TR3 was launched with a well deserved fanfare. It was a two seater convertible with an occasional rear seat that could, just about, accommodate one person sitting sideways. 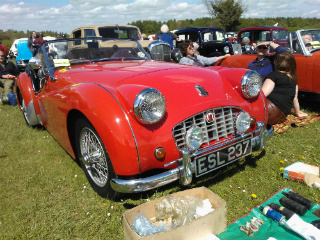 Externally, the main difference between the TR2 and TR3 was that the former had a radiator grill set well back, whilst that of the TR3 was nearly flush with the front of the car. It used the same engine as the TR2, but the power was marginally increased from 90 bhp to 95 bhp by the use of two larger SU carburettors. However, with the later addition of a high port cylinder head and enlarged manifold, power was further increased to 100 bhp. It had a four speed gearbox with an optional overdrive unit which operated on the top three gears. The first 4408 units, manufactured between 1955 and 1956, had drum brakes all round. However, in 1956, the TR3 was the first production car to have disc brakes on the front wheels, although the rear drums were retained. Sadly, none of the brakes were power assisted. The suspension consisted of coil springs at the front and a solid axle at the rear. The steering was by worm and peg. Wire wheels were optional, as was a steel hardtop, and an anti roll bar. When driven normally, it handled well and was responsive. 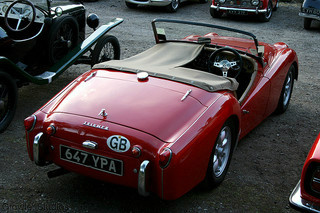 However, due to its chassis, the TR3 tended to be taller and narrower than its competitors. As a result, when cornering hard, there was a tendency for over steer, when the inside rear wheel would lift off the ground. 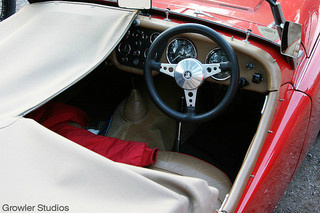 Furthermore, such over steer tended to be more sudden on the TR3 than on other such cars. An interesting feature, shared with the Jaguar XK120, were the holes in the floor, plugged with rubber bungs, that allowed the car to be jacked up from the inside. The hood would be fitted by simply snapping it on and off. Since the doors sloped downwards, there were side curtains that could be removed. Unfortunately, the optional heater tended to be rather inefficient. 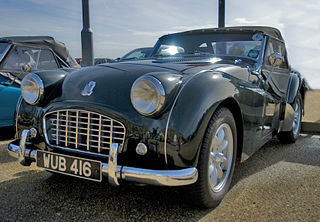 Of the 13,377 Triumph TR3's produced by 1957, only 1,286 were sold in the UK, the remainder being exported to the US. 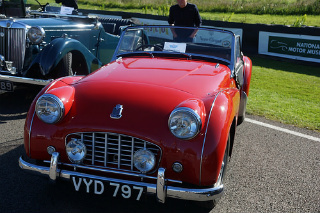 A 1955-57 Triumph TR3 sports car in very good condition can fetch as much as £23,000/$37,000 to £32,000/$51,000, whilst one in excellent condition can command as much as £47,000/$75,000. On the other hand, a TR3 ripe for restoration is worth as much as £6,000/$10,000.